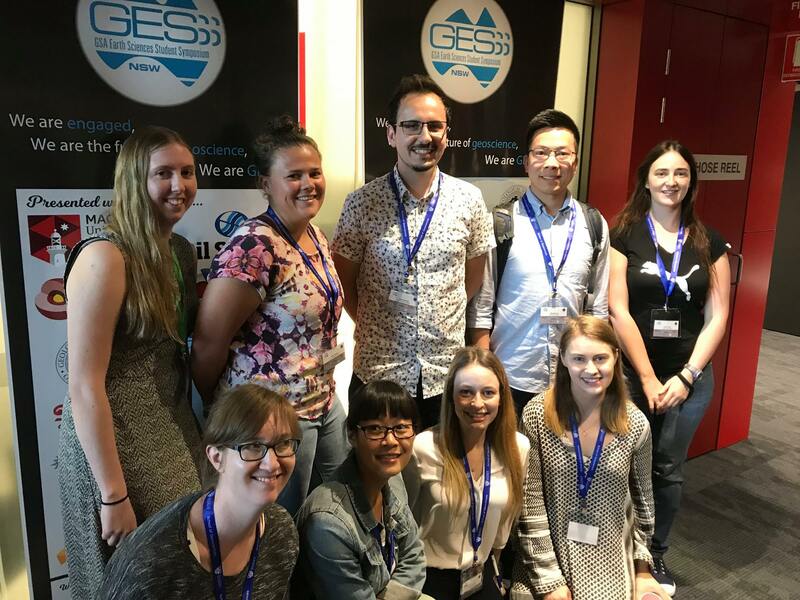 Congratulations to the EarthByte students who recently represented the School of Geosciences, University of Sydney at the student-run GSA Earth Sciences Student Symposium (GESSS) NSW conference. The event aims to bring together Honours, Masters and PhD students from across NSW to present and discuss their research in a relaxed, supportive environment; a primary goal of GESSS is to showcase Earth and Environmental Sciences to a wider community. 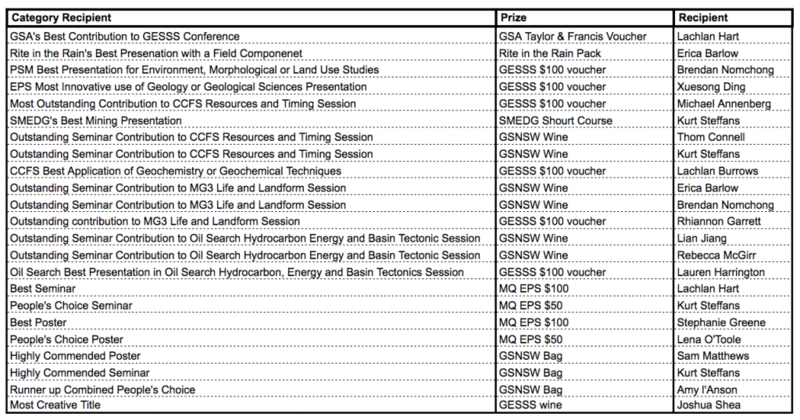 Many members of EarthByte and Sydney University Geoscience Students were also award recipients. Xuesong Ding presentation on “Influence Of Dynamic Topography On Drainage Reorganisation And Stratigraphic Sequences On Passive Continental Margins” was awarded EPS Most Innovative use of Geology or Geological Sciences Presentation. Kurt Steffans presentation on “Exploration Of Precious Opal: A Mineral System Approach” was awarded SMEDG’s Best Mining Presentation, Outstanding Seminar Contribution to CCFS Resources and Timing Session, and People’s Choice Seminar. Rhiannon Garrett talk on “Constraining Upland Erodibility In Catchments Delivering Sediment To The Gulf Of Papua” was awarded Outstanding contribution to MG3 Life and Landform Session. Rebecca McGirr presentation on “Tectonic and Geodynamic Evolution Of The Panama Isthmus Region” was awarded Outstanding Seminar Contribution to Oil Search Hydrocarbon Energy and Basin Tectonic Session. Lauren Harrington presentation on “Modelling The Evolution Of The Eromanga Sea In The Context Of Tectonics Geodynamics And Surface Processes” was awarded Oil Search Best Presentation in Oil Search Hydrocarbon Energy and Basin Tectonics Session. Lena O’Toole poster on “Newly Discovered Volcanic Centres Of Northern Zealand: Part Of An Intraplate Volcanism Pulse?” was awarded People’s Choice Poster. Amy l’Anson talk on “The Permian And Carboniferous Extensional History Of The Northern Carnarvon Basin” was awarded Runner up Combined People’s Choice.